The treatment of drinking water is vital to protecting public health. When municipalities install UV systems, the water supply is protected from chlorine-resistant microorganisms like Cryptosporidium and Giardia. UV disinfection can also be used as a virus barrier against Adenovirus, and in a multi-barrier strategy to provide confidence in the water supply. 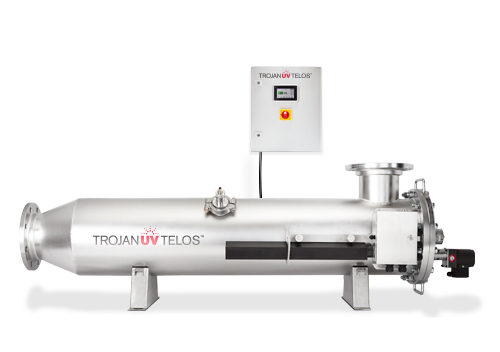 Whether the project requires DVGW or USEPA UVDGM (Ultraviolet Disinfection Guidance Manual, 2006) validation, Trojan has validated solutions for drinking water treatment. Our products range from small UV systems for small communities to large municipal water treatment plants including the world’s largest UV facility treating the water for New York City. The location of the UV system in filtered systems can either be downstream of individual filter effluent piping (taking advantage of existing piping and valving) or downstream on a common manifold (lowering UV equipment cost). UV systems can also be installed downstream of the clearwell, before or after a storage reservoir in unfiltered systems, or at each well for groundwater systems. With a broad range of models and reactor sizes, Trojan has the right solutions for any piping arrangement. Contact us at +1 (888) 220-6118, or email us today. 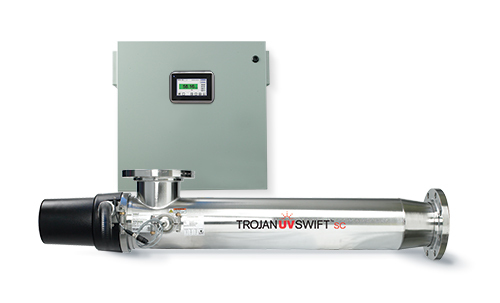 The TrojanUVSwift™SC is a validated, compact UV system that offers communities an economical solution for drinking water disinfection. The TrojanUVSwift™ offers proven performance against waterborne pathogens including viruses, bacteria and protozoa. Our advanced systems meet disinfection targets with unsurpassed reliability with no known disinfection by-products. Reducing maintenance requirements and costs while incorporating the most efficient technologies available, the TrojanUVTorrent™ leads the way for large-scale drinking water disinfection.